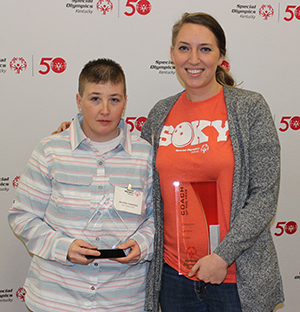 Owensboro’s Jennifer Hamilton and Murray’s Leigh Toby were named the Special Olympics Kentucky 2018 Athlete and Coach of the Year. Hamilton, 38, has been a Special Olympics athlete for 22 years. She competes in basketball, bowling, softball and track and field. Last summer, Hamilton competed at the 2018 Special Olympics USA Games with the Owensboro-based basketball team that represented Team Kentucky. She was the only female player on the team and was a top contributor at guard for the team that went undefeated in pool play and earned a bronze medal. It was the second trip to the USA Games for Hamilton, who won a basketball gold medal with the Team Kentucky women’s team at the 2010 Games in Lincoln, Neb. She was also part of the Special Olympics USA team that won a gold medal at the 2007 Special Olympics World Games in Shanghai, China. In addition to competing with Daviess County Special Olympics, Hamilton also regularly supports local fundraising programs for the organization. Hamilton has worked at Owensboro Health for 11 years. She is the first athlete from Owensboro to be named Athlete of the Year. Toby has been a coach in the Murray/Calloway County Special Olympics program for seven years, coaching basketball, bocce, soccer and softball. She also serves as a bowling Unified partner where she competes alongside a Special Olympics athlete, and volunteers with the Murray Rockets track and field team. According to Miller, Toby also draws people to support the program. And Toby’s effect on her athletes goes beyond the playing fields. In addition to being named the state’s Coach of the Year, Toby was nominated for the 2018 Special Olympics North America Coach of the Year Award. She is a case manager at Community Alternatives of Kentucky in Murray. Nominations for the 2019 Athlete and Coach of the Year Awards will open in November and be due in early December. For more information about the awards or about how to nominate a deserving athlete or coach, contact Hunter Brislin at 502-695-8222 or hbrislin@soky.org.